The River Chess flows through Chesham towards the Hertfordshire Border. 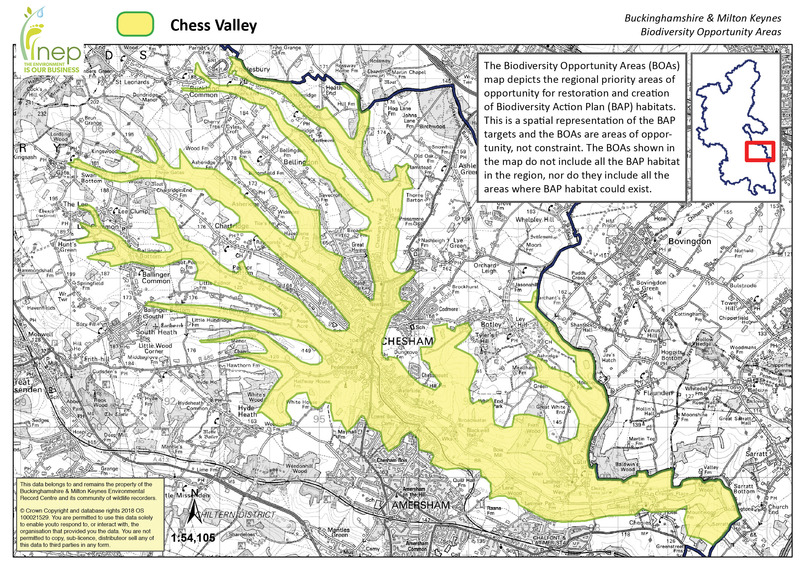 The BOA also includes the headwaters of the Chess. The area is adjacent to the Chess Valley Key Biodiversity Area in Hertfordshire. Landscape Types: Wooded agricultural land on low hills. Geology: Chalk bedrock, with alluvial deposits at the valley bottom. Chalk River – River Chess is a chalk river and is a priority UK BAP river. Hedgerows – The valleys around Chartridge have a concentration of ancient species rich hedges, while the area around Bellingdon, Cholesbury and Hawridge is predominantly pre 18th Century enclosures. There are several green lanes designated as LWSs. Acid Grassland / Heathland – There are areas of these habitats on Hawridge and Cholesbury Commons and remnants on Leyhill Common. Calcareous Grassland – There may be areas of semi-improved grassland in the BOA. Arable Field Margins – There are many arable fields in the area and the Chilterns is a Plantlife priority area for rare arable plants. Lowland Meadows – There are lowland meadows in 2 SSSIs – Frogmore Meadows and Sarratt Bottom. Woodland – The area contains 11 woodland LWSs. Traditional Orchards – There are 2 potential BAP orchards in the area. Wood Pasture and Parkland – There is existing parkland at Latimer. The Chess Valley walk runs along the valley from Chesham. The Woodland Trust own 4 woods around Chesham Bois.